Frog is the common name for amphibians in the order Anura. There is often a distinction made between frogs and toads, based on appearance, however there is no scientific distinction. The only family exclusively given the common name "toad" is Bufonidae, but many species from various other families are also called "toads". "True frogs" are of the family Ranidae. Because of the great diversity of frogs (over 4000 species), many characteristics are not shared throughout all of the species. However, there are some characteristics which distinguish them from other amphibians. Frogs are generally well suited to jumping, and have long hind legs, with elongated ankle bones. They have a short vertebral column, with no more than ten free vertebrae, followed by a fused tail bone, usually resulting in a frog without a tail. Frogs range in size from 10mm (Psyllophryne didactyla of Brazil and Eleutherodactylus iberia of Cuba) to 300mm (Goliath frog, Conraua goliath, of Cameroon). The skin is unkeratinized and hangs loosely on the body because of the lack of loose connective tissue, and can be smooth, warty or have skin folds. Frogs have three eyelid membranes: one transparent to protect the eyes underwater, and two which are translucent to opaque. They have a tympanum on each side of their head, which is involved in hearing, and is covered by skin in some species. The males of most species of frogs will call for a variety of reasons. It will call by passing air through the larynx, in the throat. In most calling frogs, the sound is amplified by the vocal sac(s). The vocal sac is a membrane of skin under the throat or on the cheeks which distends during the amplification of the call. Each call is unique to a species. The main reason for calling is for the male to attract a mate. Males will either call in a group, called a chorus, or individually. A male frog will emit a different call when mounted by another male. Many species also have a territorial call that is used to chase away other males. All of these calls are emitted with the mouth of the frog closed. A distress call is emitted by some frogs when they are in a position of danger. This is done with the mouth open, and usually results in a higher pitched call. The effectiveness of the call is unknown, however it is suspected the call intrigues the predator, until another animal is attracted, distracting them enough for its escape. Many species of frog have deep calls, or croaks. Frog noise tends to be spelt (for English speakers) as "crrrrk" in Britain and "ribbit" in the USA. This difference is due to the different species within each region(e.g. Common frog (Rana temporaria) in Britain and Leopard frog (Rana pipiens) in the USA). The croak of the American bullfrog (Rana catesbiana) is sometimes spelt "jug o' rum". Some species of frog secrete toxins from their skin. These toxins deter predatory animals from eating them, and some are extremely poisonous to humans. Generally the frog obtains the poison from the insects or animals they eat. The Australian corroboree frogs Pseudophryne corroboree and Pseudophryne pengilleyi have been discovered to be able to manufacture a unique alkaloid which is not derived from their diet (Daly). Some natives of the Amazon area extract poison from the poison dart frog and put it on their darts when hunting. It was previously a misconception that the poison was placed on arrows rather than darts. The name of the frog was changed from poison arrow frog to poison dart frog in the early 1980's. Poisonous frogs tend to advertise their toxicity with bright colours. Frogs are found nearly worldwide, but they do not occur in Antarctica and are not present on many oceanic islands. In many parts of the world, the frog populations have declined drastically since the 1950s. Many environmental scientists feel that amphibians, and frogs in particular, may be excellent biological indicators of ecosystem function because of their location on the food web, their permeable skins and their typically bi-phasic life (in both water and on land). The decline in frog diversity may also be to do with particular species having specialised on particular kinds of prey, such as certain kinds of earthworms that are themselves indicator species due to their close dependence on soil chemistry. Although habitat loss is certainly one of the most important features of most declines; pollutants, climate change, introduction of non-indigenous predators/competitors, and infectious diseases (see Chytrid fungus) have also been implicated. The life cycle of frogs contains many stages. Typically, the male frogs of a species will assemble at a still water source. They will then call, collectively becoming a chorus of frogs. The call is unique to the species, and will attract females of that species. Some species have satellite males who do not call but intercept females approaching one of the calling males. The male and female frog, will then undergo amplexus. This involves the male mounting the female. The female then releases her eggs, which the male frog covers with a sperm solution before the eggs make contact with the water. Once the eggs come in contact with the water, they will swell, and form a protective coating. The eggs are typically brown or black, with a clear, gelatine like, covering. The eggs will hatch after a short time, releasing tadpoles. The tadpoles are entirely aquatic, and undergo the most develpoment in the life cycle. They will undergo metamorphosis, in which they will develop legs, and lungs, to become a froglet, resembling an adult but retaining a vestigial tail. The final stage of development from froglet to adult frog involves apoptosis (programmed cell death) of the tail. Typically, tadpoles are herbivores, feeding mostly on algae, whereas juvenile and adult frogs are rather voracious carnivores. Most temperate species of frog reproduce in the period between late autumn to early spring. In the UK most common frog populations produce frogspawn in February although there is wide variation in timing. Water temperatures at this time of year are relatively low and typically between four and 10 degrees celsius. Reproducing in these conditions helps the developing tadpoles because dissolved oxygen concentrations in the water are highest at cold temperatures. More importantly, reproducing early in the season ensures that appropriate food is available to the developing frogs at the right time. Many species of frog deviate from the life cycle outlined above in one or several ways. Some species lay eggs on leaves above ponds, with a coating designed to retain moisture. The tadpoles drop into the water upon hatching. Other species exhibit brood care and will carry the eggs and tadpoles on their hind legs or back (e.g. the midwife toad, Alytes spp. ), in special folds on their backs, or in their stomachs (e.g. the gastric brooding frogs, Rheobatrachus spp.). In yet other species, the tadpoles overwinter and hence metamorphose at a much larger size. 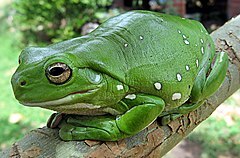 All adult frogs are carnivores, and usually eat invertebrates such as: insects, worms and spiders. However, a few of the larger species may eat larger prey, such as small mammals, fish and smaller frogs. Some frogs use their sticky tongues effectively in catching fast-moving prey, while others capture their prey, and force it into their mouth with their hands. Most tadpoles are herbivores, eating moss, or filtering small plant particles through their gills. During the process of metamorphosis, their intestine will shorten to accommodate a carnivorous diet. Some species of frogs are carnivorous at the tadpole stage, and will usually eat small larvae and small fish. Many animals eat frogs. These include birds, large fish, snakes, otters, foxes, badgers, coatis etc. Tadpoles and eggs are predated by fish, newts, predatory diving beetles, and birds such as kingfishers. Cannibalism has also been observed among tadpoles. A problem commonly associated with Anurans, is the distinction between frogs and toads. This distinction has no scientific basis, and only refers to the common name of a species. Most frogs in the Ranidae family (true frogs) and Hylidae family (tree frogs) are considered frogs, whereas all those within the Bufonidae family (true toads) are considered toads. However, many families, and even genera, have a mixture of frogs and toads, so there is no taxonomic basis. The distinction between frogs and toads usually given to the Anurans is; frogs are smooth and moist skinned, while toads have dry, warty skin. An exception can be made for the Fire-bellied toad (Bombina bombina). While its skin is slightly warty, it prefers a watery habitat. Many Anurans readily hybridise. For instance, the Edible Frog (Rana esculenta) is a hybrid of the Pool Frog (R. lessonae) and the Marsh Frog (R. ridibunda). Bombina bombina and Bombina variegata similarly form hybrids, although these are less fertile, giving rise to a hybrid zone. Frog legs are a delicacy in China, France, and in many parts of the American South, especially Louisiana. The French custom of eating frog legs is the source of the English use of the derogatory nickname "frogs" for French people. Dead frogs are often used for dissections in high school and university anatomy classes, because their internal organs are relatively odourless and can easily be injected with coloured plastics to enhance the contrast between different organs. The behavior of frogs illustrating nonaction is a myth. ("Take a pot of hot water and a frog. Throw the frog into the pot. What do you think will happen? The obvious, of course: the frog will jump out. Who likes hanging around in a pot of hot water? Now ... [t]ake a pot of cold water, put the frog in it, and place the pot on the stove. Turn on the heat. This time something different will occur. The frog, because of the incremental change in temperature, will not notice that it is slowly being boiled." (from "Life and Death in the Executive Fast Lane" by Manfred Kets de Vries) Professor Doug Melton, Harvard University Biology Department, says, "If you put a frog in boiling water, it won't jump out. It will die. If you put it in cold water, it will jump before it gets hot -- they don't sit still for you." A frog put anywhere that doesn't kill it will jump, "they don't sit still for you." Wikimedia Commons has media related to Frog.